Veterinary medical officers Ray Waters (left) and Mitch Palmer prepare to collect blood to be used in developing improved tests for tuberculosis in cattle. The USDA bovine tuberculosis eradication campaign began in 1917 and continues today. Tuberculin skin testing of cattle has been effective in reducing the incidence of tuberculosis in U.S. cattle, but more tools are needed for complete eradication. Although the prevalence of bovine tuberculosis (TB) is low in the United States, the bacterial disease can still infect cattle, wildlife, and humans. Complete eradication is not likely as long as Mycobacterium bovis, the causative agent of bovine TB, exists in wildlife, which can transmit the bacteria to cattle, and as long as available tests cannot accurately detect all TB-positive cattle from Mexico before they are imported. Scientists in the Infectious Bacterial Diseases Research Unit at the Agricultural Research Service’s National Animal Disease Center (NADC) are collaborating with international partners, the USDA’s Animal and Plant Health Inspection Service, industry, and private companies to develop new methods to prevent and control TB in cattle and wild white-tailed deer in the United States. Other countries with wildlife reservoirs of TB have been unable to eradicate the disease from cattle. Research to help control the disease targets wild boars in Spain, brushtail possums in New Zealand, and badgers in the Republic of Ireland and the United Kingdom. Strategies for both U.S. and international scientists include developing and improving TB tests and finding effective methods like vaccination to stop the spread of the disease. 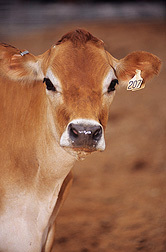 Widespread pasteurization of milk, development of a diagnostic tuberculin skin test for cattle, and establishment of an eradication program by the U.S. Department of Agriculture significantly helped decrease the incidence of bovine TB in humans in the United States. Although the cattle skin test has helped eradication efforts, it has drawbacks. A practice called “test and remove” is an option for farmers who have herds infected with TB, but the usual method is to euthanize all animals, even if only one has TB, Palmer says. A huge push is under way to develop a better test that will help producers identify and remove infected animals and keep those that are disease free. Interferon-gamma-release assays, used to detect TB, are whole-blood tests that require live white blood cells to work. Fresh blood samples cannot get too hot and must be processed within 8-30 hours, which means getting samples to a lab in good condition within a reasonable timeframe, says NADC veterinary medical officer Ray Waters. Tests that require only the liquid part of the blood—the serum—would be more convenient and less expensive, Waters says. The problem is identifying antigens that are very specific and sensitive for use in serum tests, he says. An antigen is a substance—like foreign bacteria or viruses or matter within the body—that causes the immune system to produce antibodies against it. Over the last 12 years, NADC scientists have shown that improved antigens, such as one known as “MPB83,” are crucial in developing effective assays, Waters says. These findings have played a key role in a new serum TB diagnostic test, developed by IDEXX Laboratories, Inc.
Wildlife can carry tuberculosis and spread the disease to cattle. The test has been added to the World Organization for Animal Health registry and licensed by USDA’s Center for Veterinary Biologics. It was created using IDEXX’s proven enzyme-linked immunosorbent assay (ELISA) method and based on NADC’s research that shows MPB83 is a useful antigen for bovine TB antibody-based tests. The serum test is available to countries that want to add it to their list of approved eradication-program tests. Until recently, the skin and interferon-gamma tests were the only approved tests for use on U.S. cattle, Waters adds. But the United States recently approved serum tests for use with samples from deer and elephants. Both tests were manufactured by Chembio Diagnostic Systems in close collaboration with Waters and Palmer. 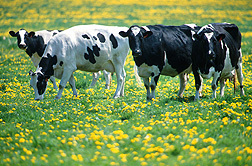 Even more recently, the IDEXX M. bovis ELISA test was approved for use with samples from cattle. Two of about 60 deer at the ARS National Animal Disease Center in Ames, Iowa. 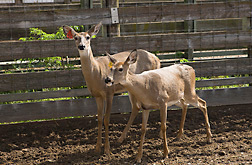 The unique research herd is used to study vaccines for prevention of tuberculosis in white-tailed deer. Another type of test—based on polymerase chain reaction (PCR) analysis of DNA—has been developed by NADC microbiologist Tyler Thacker and his colleagues. The new PCR test detects M. bovis in fresh tissues rather than the traditionally fixed tissues prepared for viewing under a microscope. It helps distinguish between M. bovis and environmental mycobacteria that can cause false-positive outcomes. Thacker looked at different PCR assays and discovered that many also picked up mycobacteria that were not M. bovis. The scientists developed a method to eliminate the environmental mycobacteria from test results. They sequenced a region of the bacterium’s DNA and developed a real-time PCR probe to help distinguish between M. bovis and other mycobacteria. The newly developed assay was tested against 11 mycobacterial species commonly cultured from diagnostic samples. Specificity for detecting M. bovis was 100 percent and sensitivity was 67 percent in samples from 30 infected and 18 uninfected animals. For more than 100 years, the Bacillus Calmette-Guerin (BCG) vaccine has proven to be safe and partially effective against TB in humans. The BCG vaccine was first tested in cows and showed protection against virulent M. bovis. Soon afterwards, it was used in humans and demonstrated protection against M. tuberculosis, the most common cause of TB in humans. Today, several different strains of BCG are used to vaccinate humans in countries where TB is still a problem. But BCG is not used in the United States, because people who are vaccinated with it might test positive when given a TB skin test, even if they don’t have the disease. NADC scientists conducted studies to find out how long BCG remains in tissues of vaccinated deer. A BCG oral bait vaccine, developed by New Zealand collaborators for the brushtail possum, was fed to captive deer at a standard dose and at 10 times the standard dose. Examination of deer 1 to 12 months after vaccination showed no traces of BCG in deer given a standard dose. But BCG was detected at 12 months in deer that received the elevated dose. Although the BCG bait, which resembles a hard cookie, worked well for captive deer in Iowa, it did not appeal to wild white-tailed deer in Michigan. Palmer and his team are collaborating with scientists at USDA’s National Wildlife Research Center in Fort Collins, Colorado, to develop a new bait to deliver the BCG vaccine to deer. They are experimenting with apple, acorn, and peanut butter flavors in hopes that one of these will whet the appetite of wild deer and provide an effective vaccination delivery method.—By Sandra Avant, Agricultural Research Service Information Staff. To reach scientists mentioned in this article, contact Sandra Avant, USDA-ARS Information Staff, 5601 Sunnyside Ave., Beltsville, MD 20705-5128; (301) 504-1627. "Overcoming Hurdles To Eradicate Tuberculosis in Cattle" was published in the September 2013 issue of Agricultural Research magazine.